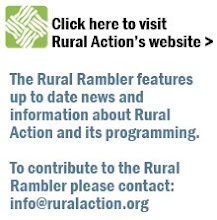 The Rural Rambler: Watershed Day Camps Make a Big Splash! Watershed Day Camps Make a Big Splash! Sunday Creek Watershed Group and Monday Creek Restoration Project, led by Americorps VISTA Heather Sheets, finished up their series of watershed day camps last week. Both Sunday Creek and Monday Creek are committed to providing these annual day camps to provide educational and recreational opportunities for the area’s youth. The camps are structured to increase the overall ecological literacy of area youth and foster a sense of wonder, responsibility, and stewardship for ecological systems and our natural world, with special attention to the places they live. They day camps’ hands-on programming stimulates awareness, expands environmental knowledge, and develops attitudes necessary to make sound decisions about environmental issues in their communities and their lifestyles. There was an overwhelming response to the camps this year with record numbers of 30 registrants for Monday Creek, and over 55 for Sunday Creek. The camps’ programming included topics on biodiversity, land use, solid waste and recycling, geology, aquatic explorations, native and invasive species, history and geography of local natural resources, creative writing, horticulture, wild crafting and wild edibles, and community based stewardship projects. Every camper received a lab book that they used all week that covered all of these topics as follow up to the programming. Monday Creek Restoration Project’s day camp took place June 15-19 in New Straitsville, Ohio. Highlights from the week included a trip to the New Straitsville History Museum and Robinson’s Cave, a trip to the rope swing in Corning, Ohio, a wild edibles hike, AMD tie dye, and a birds of prey presentation from Pat Quackenbush from Hocking Hills. Wednesday, the campers participated in a service learning project at Tecumseh Lake, where they created step stones for a community garden in Shawnee, Ohio. The last day of camp was a fun day, complete with swimming and canoeing at Lake Logan. Sunday Creek Watershed Group’s day camp took place July 20-24 in Glouster, Ohio. The first day of camp the campers went to the Ohio University Challenge Course where they did several team-building and leadership activities. Afterwards they walked to the Ohio University Ecohouse and did a scavenger hunt which allowed them to tour the facility while learning facts about CFL light bulbs, composting, rain barrels and solar panels. Campers participated in two service learning projects at Trimble High School’s Land Lab in Glouster, Ohio where they planted a native, pollinator garden and decorated a Peace Bench with their hand prints. The camp concluded again with a free day at Burr Oak State Park where the kids enjoyed fish seining, canoeing, fishing, and a locally sourced grilled meal. Not only was the camp an excellent learning experience for the area youth but with the fee for Monday Creek being $30 and the fee for Sunday Creek being $50, it provided an inexpensive alternative to day care for local parents. We received a grant from the Athens Foundation to fund the 9 scholarships that we used as well as some of the food for the meals. Most of our meals, including breakfast, lunch, and snacks, were provided by the Appalachian Nutrition Network. Ohio University donated the entire challenge course this year and all presenters also donated their time. All volunteers, Dave Sagan, Bob Scott Placier, Perry County Reycling, New Straitsville History Group, Pat Quackenbush, Ohio University Outdoor Pursuits, Nicole Stump, Ned Maxon, Kevin Fletcher, Dan Imhoff, Ohio University Office of Sustainability and Little Caesars.